Despite getting very little track time on Friday due to torrential rain, Lewis was able to demonstrate to the team just how good a driver he is in the wet. On Saturday the track remained wet for most of the day but during the warm up Lewis managed to set the 3rd fastest time whilst his straight line speed was the 2nd fastest In free practice the team tried out a different set up which proved to be the wrong call as Lewis dropped down to 9th on the time sheet. However, his straight line speed to did move up to 1st. Qualifying took place at the end of the afternoon with no real improvement in track conditions, Lewis went out on wet weather tyres for 3 laps and then came in saying that he felt he could drive the car on slicks, something the team was not sure about but it was the drivers call. Slicks were fitted by Essex & Kent Motorsport (the only team to make the change) and whilst Lewis was slower for the first few laps, once he’d put some heat into his tyres he started to go faster and faster. With just 2 minutes of qualifying remaining, Lewis was well clear at the top of the time sheet. Now with the sky looking like we may have more rain, Lewis was brought into the pits. Having seen how well Lewis was going all the teams were now changing to slicks and with the rain we expected not coming and the track drying with 30 seconds to go on the clock Lewis was demoted to 4th place for the first race and with his second best time, 3rd for the second race. Considering the quality of drivers Lewis was up against this was still a fantastic result. Sunday arrived and at last the rain had cleared, not something we really wanted as Lewis and the Hyundai had proved they were the ones to beat in the wet. Race 1: For some unknown reason, the car had lost straight line speed and although the car and Lewis looked good through the corners he had no answer to those coming past him on the straight, consequently he just fell backwards and finished a disappointing 11th, with the slowest straight line speed. Race 2: Under TCR rules, the gap between races is quite small but you cannot touch the car until 20 minutes before the pit lane opens, consequently the team after changing tyres, refuelling and checking alignment had very little time to find the problem with the loss of power the car was showing. All connections were tightened some of which did seem loose but mainly we could do nothing in the time available. 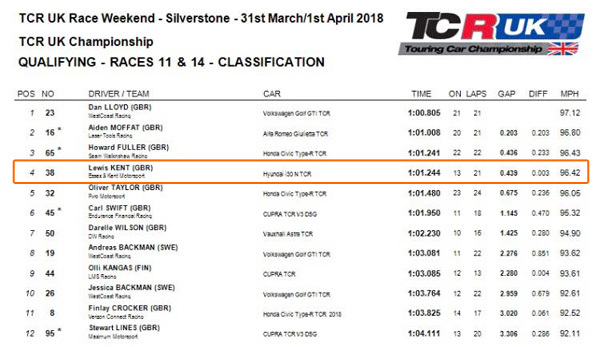 The format of TCR racing is that in the second race the top 10 qualifiers are positioned in reverse grid order meaning as Lewis had qualified 3rd he had to start from 8th position. However, Lewis’s start was a good one with him gaining several places and everybody in the team had their fingers crossed that the problem was solved. Unfortunately though, on the back straight, it became evident that the problem was still with us and throughout the race Lewis slipped further behind to finish 11th again with the slowest straight line speed. The conclusions we have come to from this first TCR race meeting is that there is no doubt Lewis has the skill and the pace to keep with the professional drivers when the car is running correctly and we as a team will come back stronger and better prepared for future meetings. 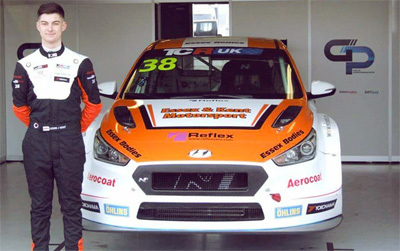 Thank you to Lee Brant and Hyundai for all their help since Silverstone to trace and correct the problem. 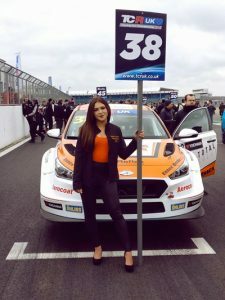 This entry was posted in Race Reports, TCR UK and tagged Essex & Kent Motorsport, Essex And Kent Motorsport, Lewis Kent, Silverstone, TCR UK, TCR UK Touring Car. Bookmark the permalink.